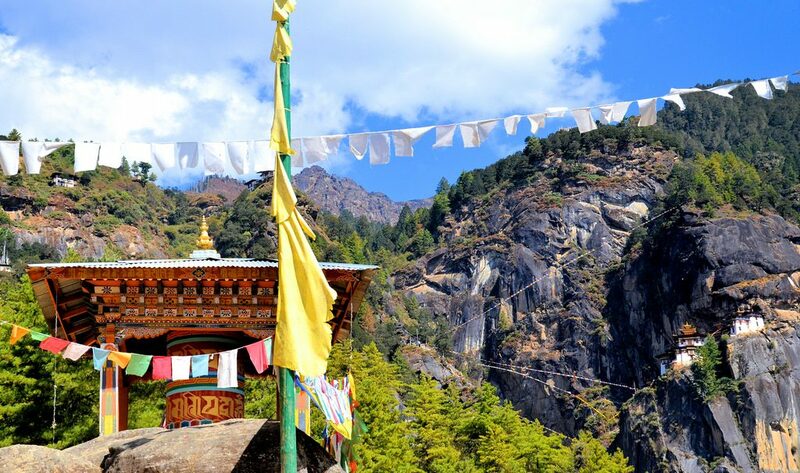 Bhutan is a truly vibrant, hospitable, colorful and a mesmerizing country to visit. The country is beautiful throughout the year, but in May you will see even more stunning landscapes. May is the last month of the Spring season. And it is the time of the year before the monsoon arrives. The atmosphere is cheerful with rhododendrons carpeting the hills. So, Bhutan tour in May is sure to display you best in the country. In May, you will find Bhutan and its valleys rejoiced in the colorful aura. Along with that, you will find this Land of Happiness even more beautiful. Bhutan is also one of the most profound countries in terms of its rich cultural diversity and heritage. Here, you can visit the ancient monasteries and their unique architectures. The weather in May is pleasant and the wildflower blossoms are a treat for eyes. The temperature starts to rise towards the end of May as summer arrives. Visiting the popular Tiger’s Nest Monastery. Exploring Thimphu- Memorial Chorten, National library, Drubthob nunnery. Dochula Pass and the 108 Chortens. Phobjikha Valley- a gorgeous wildlife reserve that is home to exotic wildlife and nature. Gangtey Valley- home to Gangtey monastery and dense forests of magnolia, rhododendrons. Bhutan in May is a great time. The best part is that the valleys come alive with flowers in bloom. Bhutan has a diverse landscape. Hence, the temperature and weather conditions vary within the country. Expect 16 degree Celsius daytime maximum temperatures in the shade with an average of 7 hours of sunshine per day in Bhutan in May. Also, May brings humidity and precipitation averaging around 44mm. Late May is when summer begins in Bhutan. And summer in Bhutan coincides with the monsoon season. So you might see some clouds over the mountains. And also could enjoy the occasional light rainfall in May. For all tariff paying tourists, accommodation in 3-star hotel will be comfortably arranged. These are government approved hotels or guest houses in twin sharing basis. The hotels have all basic amenities such as geysers, shower rooms and are well maintained. Visitors can be sure of a pleasant ambiance. The warmth, comfort, and hospitality that the hotels offer are simply incredible. For those travelers who want to upgrade their accommodations from 3 stars to Luxury hotels (4 stars and 5 stars) can do by paying the extra premium. However, you will find most luxury hotels in the western districts of Bhutan. Such as Paro, Thimphu, Punakha, Wangduephodrang, and Bumthang. While the hotels in eastern parts of the country are simple. And, they offer minimum facilities. Farmhouse facilities are also available in certain places. Such as Phobjikha under Wangdue Phodrang districts. You can witness the rural life of Bhutan by spending a few nights on these farmhouses. Moreover, there are homestays available in Bhutan too. This allows you to experience and witness the daily lifestyle of the Bhutanese people. You also get a close up look at the tradition and culture of the locals living here. However, please keep in mind that most homestays will not have hot shower facilities. But if you ask them, they will provide you with hot water by boiling it. The food you will get in Bhutan is authentic and native. You will see the Bhutanese people’s love for spices in their dishes with red hot chilies. Travelers will not find any fast food chains, like Mcdonald, KFC or subways in Bhutan. You will get a bowl full of rice with varieties of curries made of Chicken, Pork, Beef, Fish, Egg, etc. Ema Datshi ( a mixture of Chilli- Ema, and Cheese- Datshi ) is one of the unique and native dishes. One snack that visitors must try while in Bhutan is Momo, a Tibetan oriented steamed dumplings. Hotels and guest houses also offer delicious Chinese, Continental, and Indian cuisines as a meal plan. Also, they serve the meals for tourists in a buffet or a la carte system in 3-star hotels and restaurants. Eating meals in the local restaurants may not be good in all the local restaurants. Hence, we suggest you choose a proper one through your guide if you like to taste the local cuisine. Otherwise, the hotels where you stay will provide most of the Bhutanese dishes. Besides food, some of the drinks that tourists must try in Bhutan are locally brewed wine known as Ara and a salted butter tea called Suja. Thimphu is the capital of Bhutan. The city nestles in the higher ranges of the Himalayas. And offers astonishing sights of their emerald forests in May and a beautiful view of the Raidak or Chuu river. Thimphu is a must visit place blessed with old charms and modernity. The top sightseeing places in Thimphu are Buddha Dordenma, Memorial Chorten. Dechencholing Palace, Clock tower square, etc. Other tourist spots include Dzongs such as Tashichho and Simtokha. Monasteries such as Dechen Phodrang, Tango and Cheri. On the other side, Thimphu also offers charming cafe’s, bars as well as nightclubs and restaurants to socialize. Paro is the most popular destination in Bhutan. This place is peaceful with serene beauty and clean air, lush green fields and historical buildings. Here you will find the only international airport in Bhutan. Thus, Paro receives a maximum number of tourists all year round. Here you can visit the attractive dzongs, monasteries, and palaces like Paro Taktsang ( Tiger’s Nest Monastery). Paro is also a historic town and it is best explored on foot. Here, it is worth strolling and witnessing every life of the locals which ultimately makes it a must visit place in Bhutan. Another breathtaking destination in Bhutan is Punakha and this place is famous for adventure seekers. It is the best place to be for those who enjoy the adrenaline rush of river rafting in two rivers- Mo and Pho. Punakha is also widely famous for the fortress Punakha Dzong which sits majestically beside the Pho and Mo Chhu. The Himalayan town hosts masked dances with traditional music during Punakha Tsechu, a religious festival of Bhutan. Bumthang is a combination of four valleys, Chokhor, Tang, Chhume, and Ura. The four valleys are rich in natural scenarios. This is a great place to be in May. Jakar is the main town of Bumthang and is famous for honey, cheese, apples, and apricots. Bumthang valley has a spiritual significance. It is strongly associated with myths and legends. There are the oldest Buddhist temples and monasteries here. Wangdue Phodrang is another place to visit in Bhutan in May. It is a beautiful and calm town. This place lies in central Bhutan and is a border town near Punakha. It is widely famous for its bamboo products, slate and stone carvings. Another worthy attraction here is the Wangdue Phodrang Dzong. Here, you can enjoy Radak Neykhang, Archery ground, vegetable market, Army training center, Dzong gate, and 8 Chortens. In May, due to the warm temperatures, the animals and bird are more active and visible. You can see some rare and endangered species of bright and colorful birds. The mystic land of Bhutan is rich with natural beauty and this land houses over six hundred bird species. During your birding tour in Bhutan, you may catch the glimpse of Cuckoo, Swifts, Bee-eaters, Flycatchers, Imperial Heron, etc. Hence, Bhutan boasts rare bird species, flora, and fauna in locations such as Phobjikha Valley, Bomdeling, Trongsa, Bumthang, Tingtibi, Punakha, and Thimphu. These places are ideal for bird watching. Jigme Dorji is a National Park in Bhutan and is one of the top travel destinations in Asia for wildlife. May is a suitable time to visit this National park. This park is the second largest national park covering the districts such as Gasa District, Thimphu District, Paro District, Punakha, and Wangdue Phodrang Districts. The reason why Jigme Dorji National Park is famous because it has the best of both worlds. Including wildlife, there are cultural sites within the park. Here, there are about 37 known species of mammals as well as endangered species. Such as clouded leopard, snow leopard, takin, Bengal tiger, Himalayan blue sheep. Others are a Himalayan black bear, black musk deer, red panda, and Ussuri dhole. Nonetheless, this national park is also home to the sambar, serow, barking deer, marmot, goral, pika and more than 300 species of birds. Jigme Dorji National Park has all the national symbols, the Takin, Blue Poppy flower, Raven bird and the cypress tree. These features make the park one of the best places to visit in Bhutan in May. May is a great time for hiking and trekking in Bhutan. The pleasant climatic condition encourages trekking. Trekking is an ultimate adventure activity. One of the treks is the Jomolhari trek which will give you the best travel experience. This is the most popular trekking route in Bhutan as you trek along the emerald forest, beautiful landscapes, flora, and fauna. The highlights of this scenic Jomolhari trek are its virgin forest, high pastures, and ancient dzongs. In fact, you will also get a spectacular view of Mt. Jomolhari from the base camp of the same name as well. Besides this, there are several other treks that you can take such as the Dochula trek, Druk Path Trek, Phobjikha Valley trek, etc. If you enjoy bike rides, then you can take a tour on bikes to some places in May. The favorable temperature allows touring to various places in cycles or bikes. Mountain biking is an adventurous eco-friendly sport. And Bhutan has outstanding trails with vivid landscapes for every biking lovers. Being a culturally and naturally rich place, you can paddle through the rugged terrain. Also, climb and descent through many villages while taking a peek into the local lifestyle. You can enjoy thrilling activities at Paro, Phobjikha Valley, Punakha, Tongsa, Wangthang La and so on. However, it is not just the uneven roads you can embark on traversing the beautiful backdrops of Bhutan. In fact, through this expedition, one can also witness the Buddhist culture and visit the monasteries that pass the tracks. Mountain biking undoubtedly is the best way to see, feel and enjoy the destination with fun and ease. Locally known as Tshachu in Bhutan, there are many hot springs across the country. The people of Bhutan visit the hot springs in order to seek or cure health problems. Evidently, these hot springs have healing properties. The water in these hot springs contains dissolved minerals that are of great medicinal value and can do wonders to the skin and body. You can find these hot springs in places such as Dur Tshachu located in Bumthang, Gelephu located in Tshachu of southern Bhutan and Duenmang Tshachu located on the riverside of Mangde Chu. Amongst them all, Gasa Tshachu is a popular hot spring in Bhutan where one needs to do a ten-hour trek from Punakha. Hot Spring Therapy is an interesting thing to experience in Bhutan and hence you should not miss trying it. The weather in May as mentioned earlier is pleasant. Thus we suggest you carry light clothes for the day time. However, the night can be a bit colder esp in higher altitudes. Dress modestly and respectfully especially when entering temples and monasteries. Bhutan has banned Tobacco products. There are penalties for smoking in public. Ask your guide where you can smoke. Always ask and receive permission before taking photos of people, including children. Visit the farmers market and buy local products, fruits. Everything grown in Bhutan is organic. Keep extra days for any unplanned circumstances. Bhutan in May is a pleasant time to explore the beautiful country. The temperature isn’t so hot as in summer. Yet, there are few chances of rainfall which won’t last long. Choosing Bhutan tour in May allows you to walk through the Rhododendron jungles. And enjoy the bloom of various other flowers including the national flower, Blue poppy. Moreover, the high valleys hill glow impressively in May’s sun and you can see the beautiful Himalayan landscapes. With fewer tourists compared to other Spring months, this is an ideal time for those who want to enjoy a peaceful time with nature. For further question or queries, please feel free to contact us. It is our pleasure to guide and assist you in planning your Bhutan trip.